Chappell had recently suggested that it`s time that the Indian Test captaincy is handed over to Virat Kohli as Dhoni hasn`t been upto the mark as a leader in the longer version. Dravid also praised his former Karnataka teammate Stuart Binny for proving his critics wrong by playing a match-saving innings of 78 at Trent Bridge. "Stuart, I feel proved to everyone that he belongs to the international arena. People complained that he did not bowl enough. But that was simply because the conditions were not very suited to his style of bowling. 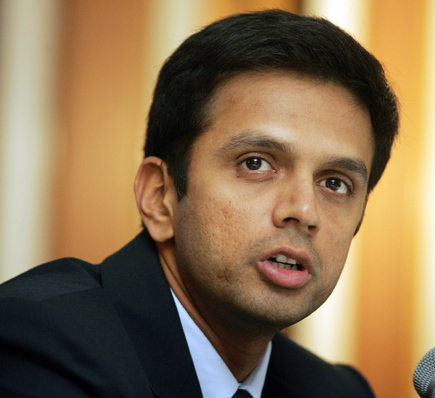 I think he will get more chances at the Lord`s," said Dravid, who spoke on the occasion of being appointed member of the Laureus Sports Academy. Asked about the challenges awaiting India in the second Test starting tomorrow, Dravid said,"Lord`s will provide a different set of challenges to what one saw at Trent Bridge in the first Test. The conditions will be a little different and the pitch could be of greater help to the pace bowlers. I am looking forward to an exciting game." Dravid also feels that Ravichandran Ashwin should be patient and wait for his chance as he will certainly get a look-in, depending on the conditions. "Given Jadeja`s recent performances, it was difficult to leave him out of the side for the Trent Bridge Test. I am sure Ashwin will get his chance depending on the conditions." India's second highest run-getter in Tests is not overtly worried about Shikhar Dhawan not getting runs in the first Test at Trent Bridge. "The openers got off to a good start in the first Test but somehow Dhawan could not make it count. So we should not be too worried. I am happy for Vijay though. He has worked very hard and he certainly deserved the century. Hopefully, he (Vijay) will build up on that innings in the series." Dravid urged the ICC to thoroughly investigate the Ravindra Jadeja-Jimmy Anderson controversy but refused to draw a parallel with the Jelly-Bean incident involving Zaheer Khan and the England players during the 2007 series which India won under his captaincy.